This week gets off to a tricky start. From 16-18 July, we get two squares: Mars with Uranus, and Venus with Neptune. So imagine warlike Mars squaring volatile Uranus – the warrior planet versus the galaxy’s rebel-without-a-cause, rubbing each other the wrong way. Dynamics grow unpredictable at best; tempers flare unexpectedly at worst. You might find yourself feeling energetic, restless, and/or irritable. Work off that energy in productive ways: join an exercise class, an open mic night, a jam session… options abound once you look. Personally, I’m not too bothered about the Mars-Uranus square. People get upset, but eventually they get over it. (Most of the time, anyway.) I’d be a tad more concerned about what loving Venus and whimsical Neptune, currently retrograde, are up to. Beware of placing the object of your admiration on a pedestal – this square could well result in delusions (of romance, grandeur, etc) overtaking sound logic and honest emotion. It’s nice that your hot co-worker offered you a ride to the bus stop, but is that really a sign to start planning your future wedding? look before you leap! don’t believe everything you see, hear, and/or read – on the internet, your group chat, or the grapevine. LEFT: TWO OF PENTACLES. This card sometimes denotes the presence of stress, but also gives us the encouragement that we have all the resources we need to handle diverse priorities + obligations. As advice, the Two of Pentacles urges the need for maintaining inner equilibrium – an interesting point when we look at the next card. MIDDLE: TEMPERANCE REVERSED. Upright, Temperance is the card of moderation, balance, and patience. Upside-down, your balance is thrown, and your energies are scattered. You might be feeling impatient, frustrated, yet strangely unfocused – the outcome of having too much to consider or feeling like all your options are blocked off from you. 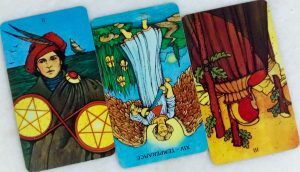 As advice, Temperance reversed asks: what are you doing too much or too little of that is stopping you from actually moving forward? Is it time to get your act together? RIGHT: THREE OF RODS REVERSED. This card represents brave new endeavours; when reversed, the Three of Rods advises prudence and a possible need to tweak your plans. (Remember what we mentioned earlier about the Venus-Neptune Rx square and the risks of delusion.) By all means, take action – Temperance reversed hints at the same – but success needs to be sustainable. Break big plans down into smaller tasks and work from there. Accumulate a succession of small gains and you’ll go a long way.